Lionel Reynaud | TOP TIPS : Let’s go more interactive ! Home / Coaching / TOP TIPS : Let’s go more interactive ! Thank for the interest in my website; you are more and more to read it every week. What I propose to you this week is to start a more interactive way of sharing best practices on Cycling. Lionelreynaud.com has started a kind of mutation with first for the riders I coached with their own training platform. What I propose to you is to build together the content of my future website ! So let’s try this move to more interactivity step by step. You have question about training, powermeter use, you struggle with your current training ? Let’s ask me directly on your issue or interest … I have already received some message about powermeter ban in next Tour but let’s not spoil ! You have up to the First of May to send me your question (it could be training, power training, cycling events, …. up to you guys !). How to send my question ? 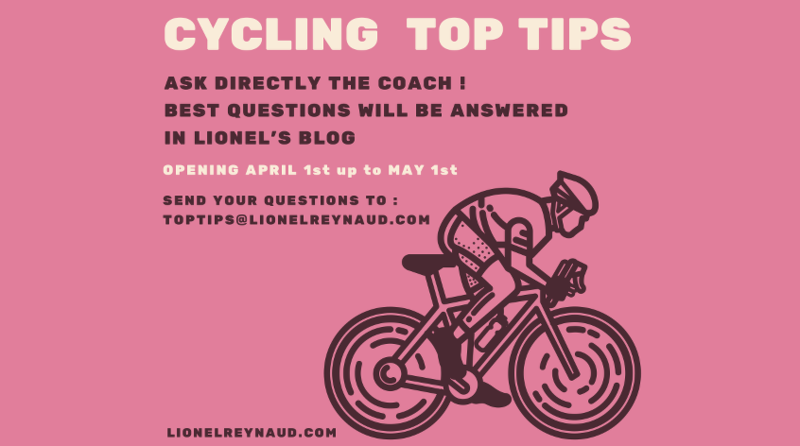 Very simple, you can use the form of the website (do not forget to put Top Tips in the message subject) or you you can send an email directly to : toptips@lionelreynaud.com . Good luck for your submission and check regularly your email, I will post my answer in my website with a specific article. Train smart and have Fun !